Dubai, UAE, 8 January 2018: Emirates Group Security and Etihad Aviation Group (EAG) have signed a Memorandum of Understanding (MoU) for cooperation in aviation security. The MoU was signed by Sir Tim Clark, President Emirates Airline, and Tony Douglas, Group Chief Executive Officer of Etihad Aviation Group, in the presence of His Highness Sheikh Ahmed bin Saeed Al Maktoum, Chairman and Chief Executive, Emirates Airline & Group, His Excellency Hamad Abdulla Al Shamsi, Vice Chairman, Etihad Aviation Group and senior representatives from Emirates Group Security, Etihad Aviation Group, at the Emirates Group Headquarters in Dubai. HH Sheikh Ahmed said: "Security is one of the foremost priorities of the global aviation industry. Over the years, Emirates Group Security has built strong expertise and capabilities to successfully navigate the complex landscape of security risks and threats in aviation. Through this agreement, Emirates Group Security will collaborate with Etihad Aviation Group to share know-how and extend aviation security services in order to better handle shared challenges, which ultimately benefits travellers." "Security is our utmost priority and given the current sensitive climate we operate in, it should never be underestimated. The signing of an MoU between the two largest aviation groups in the country will have a positive impact on local and international operations by significantly enhancing aviation security measures. 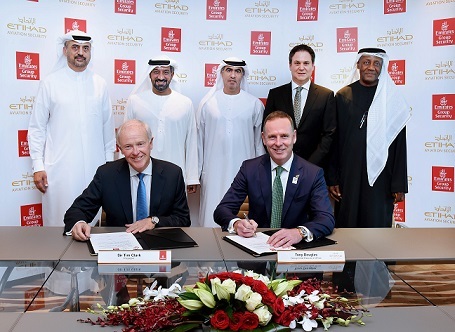 By working closely together, and pooling our expertise and resources, Etihad Aviation Group and Emirates Group Security will build a stronger platform from which to share best practice and knowledge, allowing us to provide the safest travelling environment for our customers." Emirates Group Security is the award winning, multi-faceted organisation that develops and implements security measures and strategies across the Emirates Group. Offering a wide spectrum of security services ranging from general to aviation specific, Emirates Group Security employs more than 400 staff directly and over 2,000 security staff through its service partner Transguard Group (TG). Emirates Group Security extends its special aviation security services beyond Emirates to other airlines that operate in and out of Dubai International Airport on a commercial basis. Emirates Group Security has also set up its learning and development arm – Centre of Aviation and Security Studies (CASS) - in partnership with Edith Cowan University to develop career ready professionals for the aviation and general security industry.